My quest to read the huge books I’ve had sitting around for years on my shelves continues, and I am delighted to finally be able to look at the large space The Crimson Petal and the White takes up without feeling guilty. People have been telling me for years that I should read it, and I quite agreed with them – it really is right up my street. Set in Victorian London, and telling the tale of an intelligent and ambitious prostitute who longs for a better life and hates the fact that she has to use a man to do so, it’s a rich, dense slice of Victoriana that I knew I would enjoy every moment of – when I could spare the time to fully enjoy its hundreds and hundreds and so many hundreds of pages. Thank goodness for half term, and thank goodness for my Kindle ipad app, because I own the hardcover and taking that anywhere further from the sofa is an impossibility! It took me a good two weeks of solid reading, but I got there in the end! Sugar is a high class prostitute – much sought after, and even mentioned in a saucy guide to London as one of the best women to be had for the discerning man about town. Still a teenager, she was forced into prostitution from a young age by her brothel owning mother, and is determined to one day leave and make a better life for herself, where she can be appreciated for her personality and intelligence rather than just her sexual prowess. She reads Shakespeare and is secretly writing a feminist novel based on her experiences of menfolk, while using her considerable wit and wiles to secure herself the reputation of being one of the best prostitutes in London. One night this reputation brings William Rackham to her door. A middle class gentleman in his early thirties, William is a failed intellectual with an insane wife and a father who is refusing to financially support him. His life a mire of disappointment and disillusionment, William finds in Sugar the answer to all his prayers. Soon she becomes indispensable to him, and she inspires him to improve his life. No longer content to be an impoverished layabout, William takes over the reins of his father’s perfumery company, and with Sugar’s help and advice, makes it into an enormous success. Money comes flooding in, and enables him to set Sugar up in a separate household all of her own. Freed from her mother’s clutches, Sugar finally has the escape she always wanted, but she soon finds out that being a kept woman is not the dream existence she hoped it would be. This is such a rich, multi-layered novel that a short review can’t hope to do it justice, and there are many more characters than I’ve mentioned, which helps to explain why it is so many hundreds of pages long (more than 800!). What I loved the most about it is its characterisation; I felt, by the end of the novel, that I knew each of the characters intimately. They could have been sitting in the room with me, they had become so alive in my imagination. Each character – from the fascinating, desperately tragic Agnes, to William’s hilariously vile university friends – is finely drawn with such attention to detail to the vagaries of human nature. While both Sugar and William do unforgiveable things to one another, their behavior is perfectly justifiable within the context of their life experiences, and the reader is pulled in all sorts of moral and emotional directions, especially towards the end of the novel as the story builds to its shocking conclusion. 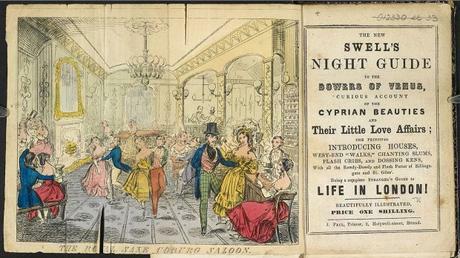 It is a marvellously imagined tale that brings the grimy, reeking, cacophonous streets of Victorian London to life, alongside the quiet, ordered, plush-lined and candlelit parlours of the Victorian domestic interior. The lives of women – sequestered, marginalised, abused, controlled – in various ways, for various reasons, for various purposes – are sensitively, powerfully and sympathetically drawn. I loved every minute of it, and had a period of mourning once I had finished, so sad was I to leave its world behind. Yes, it’s ridiculously long, but it really is worth every page. I was only sorry to have left it languishing on my shelf for so long! If you haven’t given it a try yet, I encourage you to give it a go!